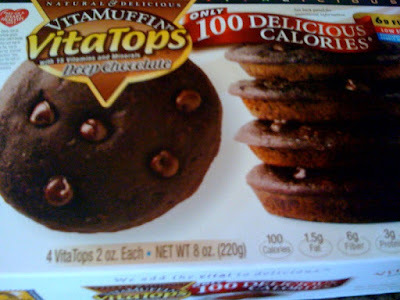 Remember the "Muffin Top" Seinfeld episode ? I found these are Market Street. They are highly recommended by Hungry Girl. She uses them in her recipe book "200 Recipes under 200 Calories". 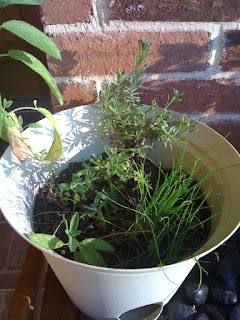 Sage, Chives, and Lavender are hanging in there. The sage actually looks better than this picture portrays. It's not all yellow.. 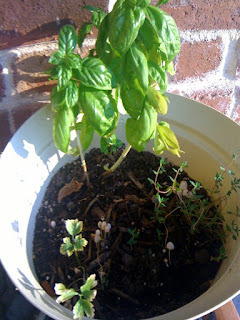 Basil, Italian Parsley and Thyme... hmmm... and now "fungi"..what do you do with that? 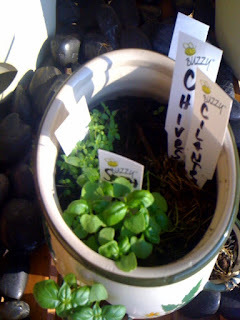 The Buzzyseed pot - Basil and Thyme are doing great. Cilantro is dead... you can see the dead leaves on the right hand side of this picture. Poor poor Cilantro... 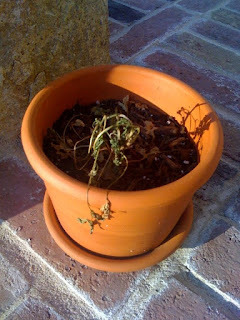 I was going to re-pot it for better drainage, but I think it's too late. Overall, I think my project is going pretty well considering that I started it in the summer, and we have had consistently 99 degree days for like 3 weeks now. I feel bad for the Cilantro, but I have heard it is a very hard herb to grow so I will re-visit Cilantro in the Fall or next Spring. This looks like fun!!! Can't wait to try them.